Built in the VIII cent. on the ruins of the Temple (I cent. A.C.) dedicated to the Dioscurs, Castor and Pollux, it is situated in the heart of Naples’ center, in the Foro of the ancient Neapolis. The early Christian church, dedicated to San Paolo, preserved of the ancient Temple the pronaos with 8 Corinthian columns, that was afterwards destroyed from the 1688 earthquake. The actual Basilica is the result of the transformations that occurred in the 500’s. 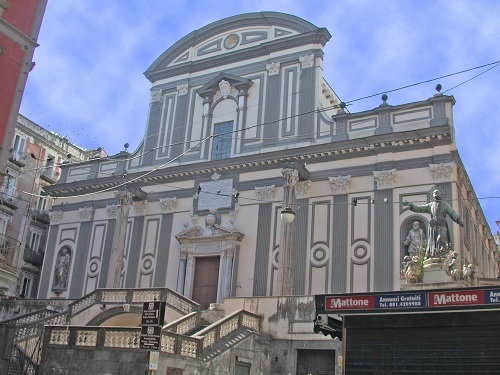 It rises on top of a large stairway with two ramps and has on each façade two niches with the statues of the Saints Pietro and Paolo and two Corinthian columns of the former Temple of the Dioscurs with traces of architraves. Of the original plan a wall at the end of the stairs in opus reticulatum remains. Between the second half of the XVI cent. and the beginnings of the XVII cent. 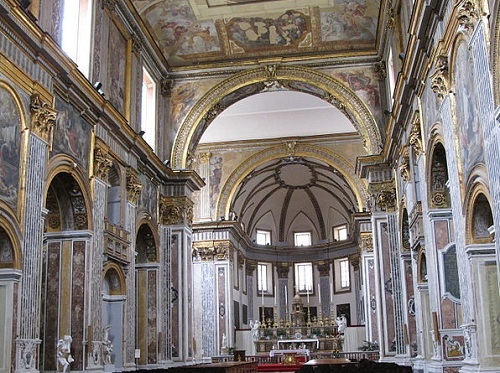 the church was restored and enlarged many times: the lateral naves with chapels were added to the central one, the apse and the transept were built. The plan is latin-cross divided by three naves. The interior’s decorations are Baroque with polychromatic marble decorations and precious floors. 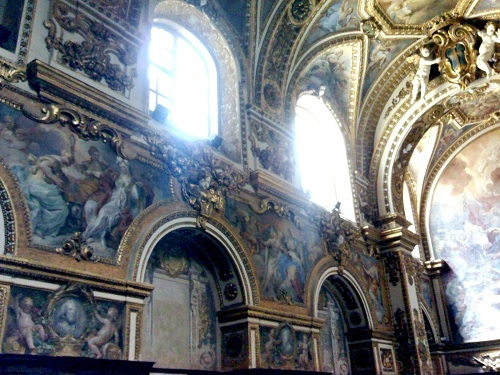 Many works of artistic interest: in the central nave frescoes of Massimo Stanzione of 1644, restored during the 800’s from Cammarano; the Sacresty of Solimena so called because it was entirely frescoed by Francesco Solimena between 1689 and 1690, is located in the bottom of the central nave of the basilica, behind the high altar, which is accessible through a small door on the right wall. This is one of the most expressive works of the author Naples.